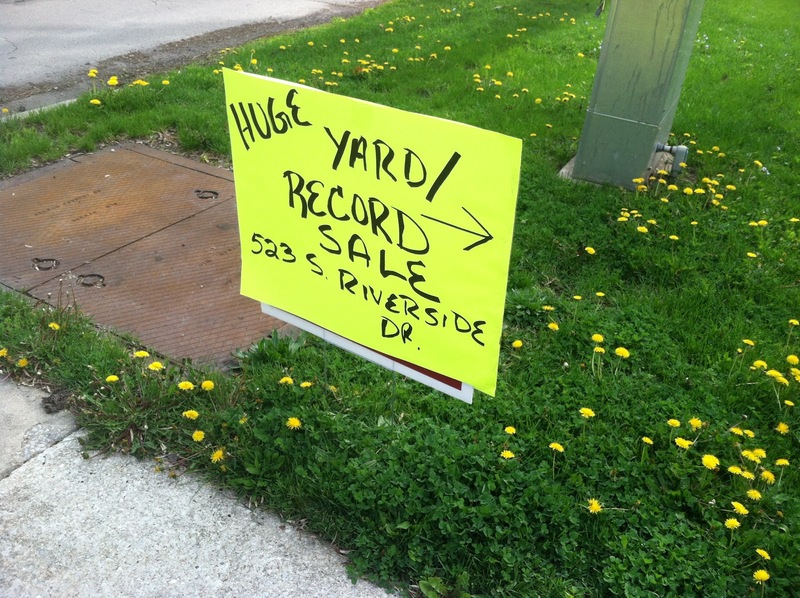 Vinyl Record Album Collecting in Chicago and the USA: Best. Day. Ever. I recently discovered gsalr.com which is a website that consolidates info on yard/garage/rummage/etc sales. These are always prime targets for old vinyl but now you can not only find them with a few clicks, I get daily emails that list all the sales within 20 miles of my home and even highlight the word 'records' in the descriptions of the listings. I only discovered this awesome free service last week and by Friday I had two local sales lined up that had records in store. I went out Friday night and had a really wild time, I knew I'd be in rough shape in the morning but there was no rush as neither sale opened until 9am and they were both pretty close. Huge yard sale. Saturday May 10 One Day Only! 8:00-4:00 or whenever. Have thousands of LP records including funk, soul, jazz, & blues. Most are promos including white labels. Also have a ton of 78's & 1000's of CD's!! CD's are all genre's. Come early for the best stuff. If there are any dealers, we are of course looking to sell the whole lot. There was less than an hour until they opened and I could not think straight. The sale was all the way west in Villa Park. How they hell could I get there on a bike? I knew a Metra line went that way - I'd have to bike a few miles to Melrose Park or Maywood to get to that line, no big deal. Checked the schedule - the next train was 11am. That wouldn't work at all! I then started checking the Pace bus routes. The North Ave. bus stops at Wolf - nowhere near close enough. Then I discovered the St. Charles Road bus actually originates on Lake Street as far east as I am. I jumped to the departure predictions and saw one was due at 5th Ave. in about 35 minutes. It was a 3.5 mile ride. I did the math and threw my clothes on (still scattered on my living room couch from the previous evenings blackout), brushed my teeth and grabbed my bike. I've ridden drunk before (obviously) and in all kinds of bad conditions, internal and external. But I don't know that I've ever done a ride quite this hungover, though again I am not certain that is the most accurate way to describe my condition. Worse yet, I knew I had to keep a decent pace to get there in time. My mind kind of just shut down and I dug in. Traffic was light and it was positively beautiful outside. Before long I got down to Lake Street as most of its residents still slept. I gagged and laughed a bit thinking that I might vomit right there on the curbside but I controlled myself. Before long my bus arrived (right on time); I put my bike on the rack and got on board. Next stop: Route 83. It was just about a mile ride from St. Charles/83 - I saw some signs along the way and bristled with delight at each one. Just around the corner, I came upon the motherlode. A driveway filled with cardboard boxes. My condition had not improved but suddenly I was numb to it - time to get involved with some vinyl! As promised, the only genres represented were jazz, funk/soul and disco. I dove into the 5-6 boxes of jazz and got to work. Each jacket had a price tag that also listed a peculiar moniker. 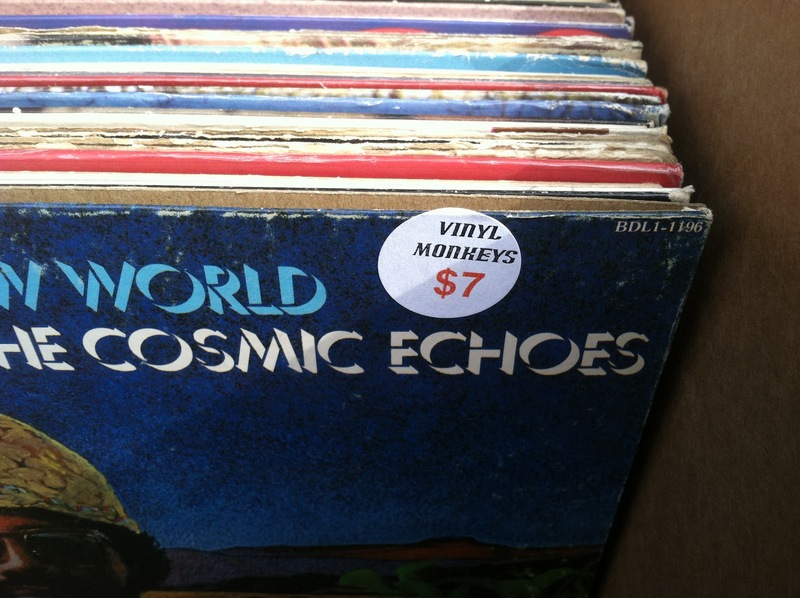 Vinyl Monkey? This sounded familiar - in fact, I could see the releases at home I already owned with these stickers. But I couldn't place the store, or the place....I knew I had never been to a store with that name. What did all this mean? I turned and looked at the proprietors. We got to talking - their first remark was 'I knew we recognized you'. It was the CHIRP Record Fair! Their faces came into the focus of my mind's eye and I even remembered the releases I grabbed from them -- specifically two rare CTI 3000 series promo copies. No shock that I found another, albeit one which I already own in this case (the standard issue, that is). I also scooped up a slightly beat down copy of 'Mister Magic' for only $3. And like their generosity at the fair, they called it even on the $10 for 'Road Song' and I got that record for nothing. In the meantime they had some trouble with their credit card equipment so I volunteered to spin on over to get some cash, at which point I also scarfed a chicken salad sandwich and a bottle of OJ. Power meter status: 62% and rising. With our transactions squared away, I headed out unsure of where to go next or how to get there. I checked the Metra schedule which at this point was equally as inconvienent or worse. I considered the bus briefly then decided to hell with it - I had seen the Prarie Path bike trail on my jaunt to the gas station ATM so I headed back to it. I reviewed the map on a sign and got my sense of direction, then headed out. About 7 miles later the path ended. I tried to follow the signs to get back on it but gave up once I got my bearings I saw where I was - around Manheim and Lake Street. I determined that surface streets would do it for me now and then remembered the two other garage sales I had planned to visit all along. I checked the map and chuckled when I saw that the first of the two lie dead in my path - just off of Manheim/Fullerton. I stopped at that intersection for my fuel - an energy bar and a bottle of water, with plans for big eats soon. With probably 12 miles under my belt now I marveled at how bad I felt in the earlier AM and that I had recovered enough to make it this far. I trudged on. 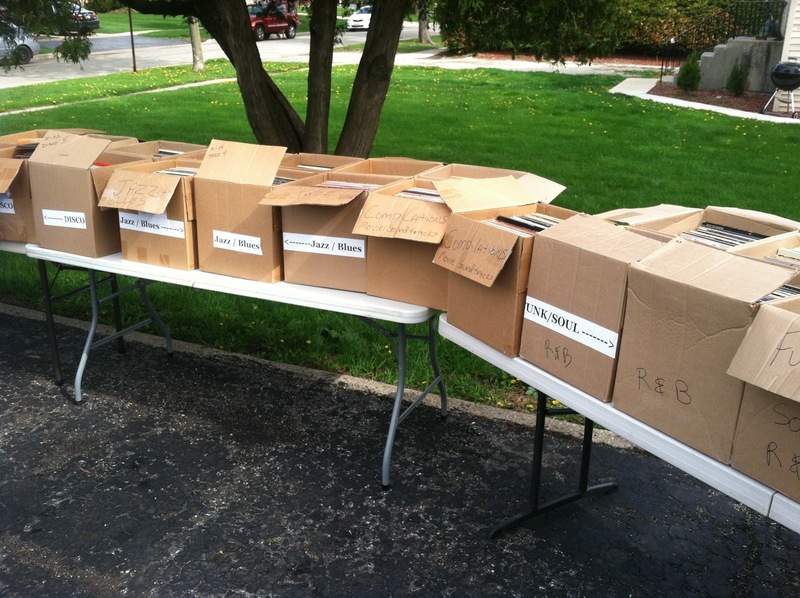 The first garage sale wasn't a garage sale at all - it was an estate sale. I let myself inside and was greeted by a smiling face who led me to a back bedroom. 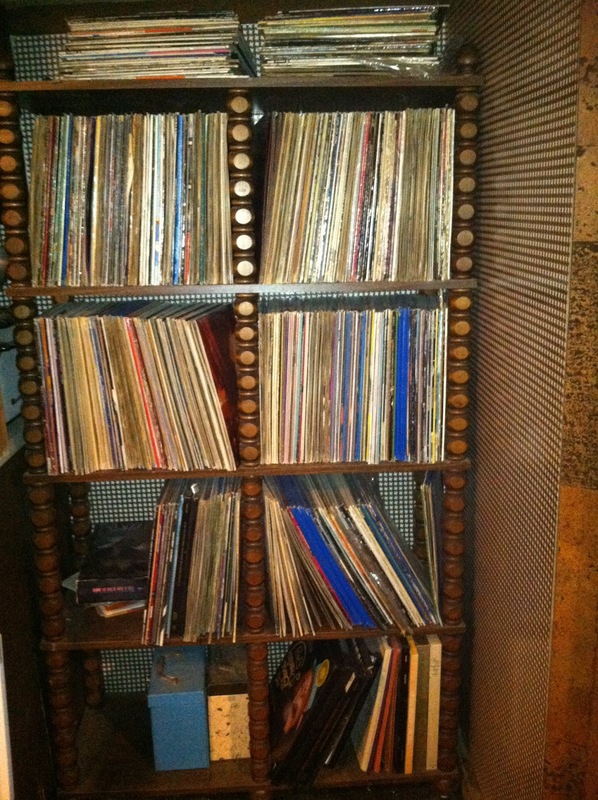 She had neatly organized them by genre, with a separate long box full of 45s. I scanned through the LPs and glanced at the 7"s....walked away with Blood, Sweat and Tears eponymous second album which contains almost all of their hits (or at least my favorites) save for a couple of Kooper tracks on the debut. 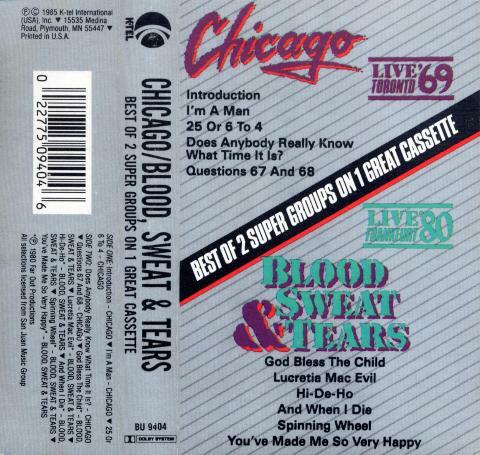 When I was a kid, my dad got me a 'split' cassette from this group and Chicago. In fact - here it is! (I can't believe I found this). I listened to that thing so many times, it was just mindless. It was like I was programming a computer (myself) by rote, repeated exposure. That isn't to say I didn't like it, I did. But it was just about my first real music experience in life, it was so special to me (still is) that I just couldn't get over it. The only song that tape is missing is 'God Bless the Child' which I have been cranking LOUDLY since I brought the platter home yesterday. Departing from the estate sale I got back onto the bike and for the first time began to think about food and sleep, and not records. But my final stop wasn't terribly out of the way so onward I rode. I rode east on Schiller Blvd. and took heart in the fact that I was at least riding in a direction directly toward my bed. I came upon a marvelously clean garage in which sat two smiling and just wonderful people who's names I do not know, and whom I will unfortunately never see again. What took place in their garage - and their home - was only evidence of the fact that human nature is not just war and death; that if you put forth effort to network in your chosen hobby/obsession you will indeed benefit; and that good people exist who will actually open their home to a stranger. After my already excellent Saturday morning, I can quite sarcastically say that I did not deserve this extended good fortune. I greeted them and asked if they had records - they pointed to a small bin at their feet. This was 20 records maximum so I was a little disappointed but I was eager to get home at this point, so I knelt down to do the deed and move on. Toward the back of the bin I found an absolutely excellent album I have really enjoyed since I got it home - and one who's value exceeds the single dollar I paid for it. But that was not all. They inquired if I was a record collector. I responded that this is exactly what brought me to their home. Silently, they looked at each other (sharing their judgement of my character via the type of telepathy that only comes from years of marriage) and they said they had 'lots' more records inside, and I was welcome to look. The thought of additional records to view was exciting, but the idea of wandering around in people's homes is far more so. Down into the basement we went. We chatted as I searched in a dimly lit corner through a shelf with probably 75 records or more. Came up with an Epic era Engelbert record as well as a CTI 6000 series gem from George Benson - both in staggeringly good condition to boot. The charge? $1 a piece. These people were so nice and their home so clean and orderly (and the garage) I wanted to ask them if I could just hang out. Such good people. Still not done - I rode in the opposite direction and spent $18 at a deli for a copious amount of foods consumed on site and packed into my bag for later. 15 miles - 3 distinct spots - 6 records. Best weather so far this year, and all done spur of the moment on a morning when I had every excuse to lie in bed.